The weather was a bit chilly for the opening morning of Bike to Work Week, but this appeared not to be too discouraging, as many riders were out today in honor of this great event. Jeff and Amy Potter rode out to City Supervisor Shelly Aldean’s house, and picked her up on a tandem mountain bike. 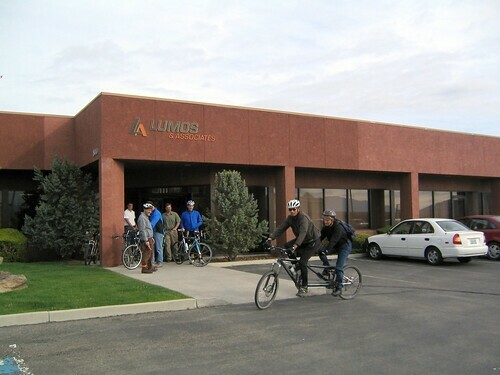 The three rode from North Carson City to Lumos and Associates, where News Carson City and many more riders were waiting to greet them. Right before the interview started, two cars sped down College Parkway. The following car had his horn full on, and was obviously in pursuit, following just a couple feet off the leading car’s bumper. I guess the Drive your Car to Work Week folks aren’t having nearly as much fun! We were informed later by News Carson City’s Dave Morgan that the road rager in the SUV was pulled over by the police! A fitting end to that event. After the brief interview, a few of us rode with Jeff P and Shelly Aldean, escorting them on their way to her office. We took the freeway bike path to Long Street, South on Saliman, and then West on 5th Street. The route was quite pleasant, with light, slow traffic. A great way to kick off Bike to Work Week! jeff p – very cool! nice work and nice news coverage. anyone else (appeal?) picking up the story? The Nevada Appeal was not present; however, the Appeal has a little article about Bike to Work Week. It seems to be a smattering of info collected from google searches mixed in with some misinformation. Nobody interviewed Jeff P from the Appeal, and yet there are all sorts of quotes from him. They make it appear that he’s taking credit for the work of others too! Hey did you hear? Jeff P built C-Hill with leftover Creek Trail dirt! The Appeal Story can be read HERE. From what I understand, there aren’t many reporters left at the Appeal, and they may be stretched too thin. It’s too bad they couldn’t have done this right! Well, that’s one way to wake up the city officials to our plight. Show them what we deal with every day. then end of the article sorta dangles too when he refers to spin class people buying real bikes now. are they commuting on them? and a good, honest microbrewed IPA at an affordable price. and a record store. Dave of News Carson City does a hell of a job. He gets more local news quicker than the Appeal, Journal or the Reno TV stations.